Nearly 3 years ago I have bought myself a PogoplugV2 (see Post). 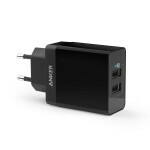 It is still an awesome device for this price and worked without any issue the whole time. 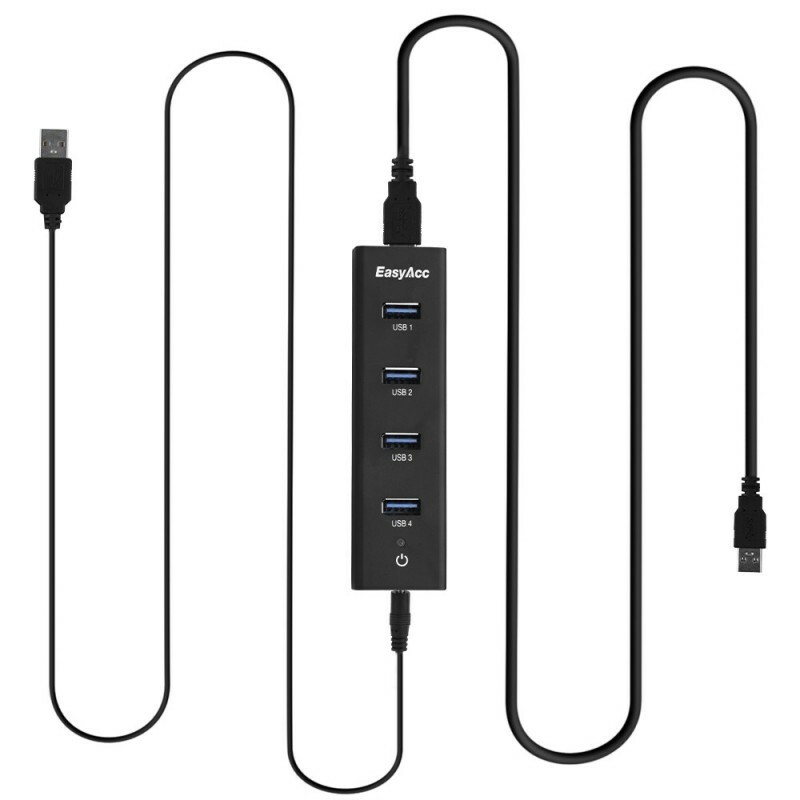 at least 2 USB 3.0 ports because I want to attach 2 active 4-port USB hubs. 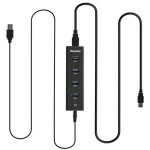 Almost all USB hubs >4 ports are cascaded 4 port hubs. This is quite bad because it can cause a lot of compatibility and of course performance issues. After a bit of research I have bought an ODROID-XU4. 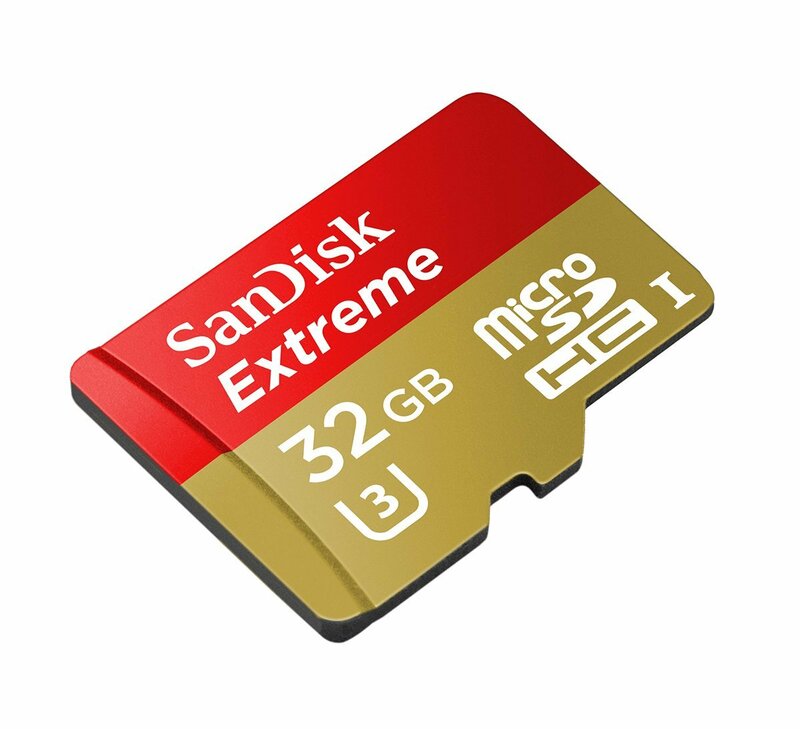 I am using a microSD Card for OS because eMMC is quite expensive. Boot times and program loading times are not that important my use case. With two additional 4 port active USB 3.0 hubs I have 8 USB 3.0 ports and 1 USB 2.0 port. At the moment 5 disks are connected with a total of 7.5 TB storage. Connecting a 2 TB disk to each USB 3.0 port would be 16 TB storage which should be good enough for some time. The ODROID-XU4 SOC is the same as its predecessor ODROID-XU3. That is why they share a common kernel and os images are compatible. Also I really like Arch Linux I have chosen a different path this time. There is OpenMediaVault (OMV) for some Odroids. I thought hey let’s give it a try the web interface looks quite nice. After a few days I can say I really like it. The web interface is really good and looks modern. OMV is running on Debian Wheezy 7.9. Insert your microSD card and power your Odroid. I will not go into detail on how to configure stuff in the web interface because that is really easy and straightforward. I will focus on optimizing performance and adding a few neat features. Connect to your Odroid via SSH with default login credentials (see above). You should change your web interface password, too. and some more set’s from the bottom of the file as you like. Note: If you are not familiar with vi/vim you can use nano to edit all files. Performance with default settings was really bad. Disk read and write was around 30MB/s to ext4 and SSH was laggy. After a few minutes I have found the issue. Per default OMV sets the conservative governor. This may work well with x86 CPUs or other ARM CPUs but with Odroid it is a pain. In the web interface under “Power Management” is an option called “Monitoring – Specifies whether to monitor the system status and select the most appropriate CPU level.” This sounds quite good, problem is this option sets the cpu governor to conservative. Conservative governor with default settings works really bad on Odroid in combination with I/O. Disabling this option sets governor to performance. All 8 cores at max clock speed the whole time produce quite a bit of heat (fan spinning a lot) and it is not really energy efficient. But no problem we can change the governor to ondemand and with a little bit tuning your Odroid will fly. The following settings will replace conservative with ondemand governor if you enable the Power Management option. I did benchmarks with all these settings and for me this is the sweet spot. 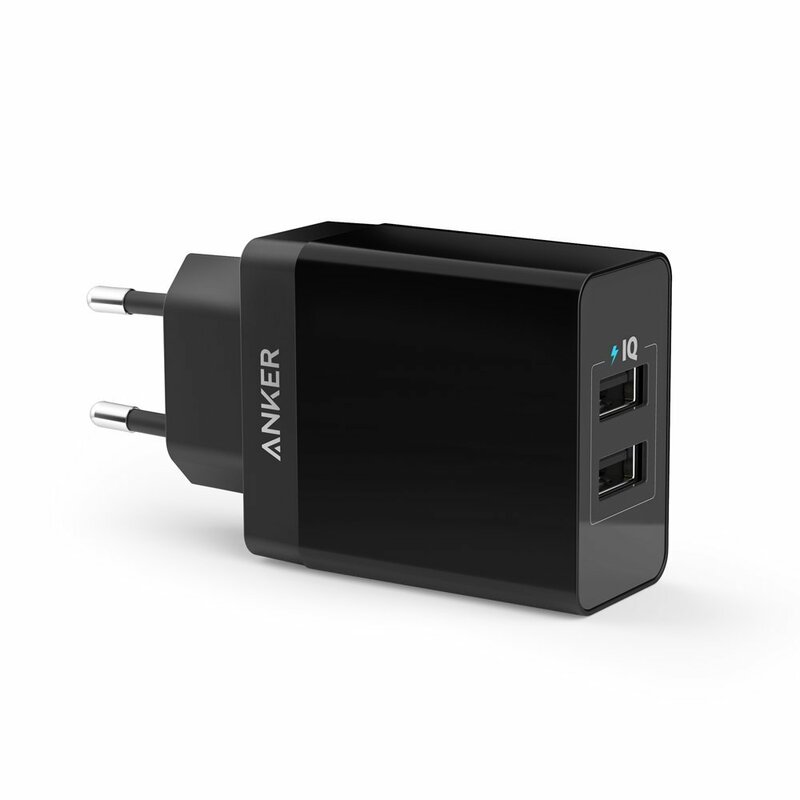 Nearly same performance as performance governor but lower frequency and less power consumption when idle. sampling_down_factor: this parameter controls the rate at which the kernel makes a decision on when to decrease the frequency while running at top speed. When set to 1 (the default) decisions to reevaluate load are made at the same interval regardless of current clock speed. But when set to greater than 1 (e.g. 100) it acts as a multiplier for the scheduling interval for reevaluating load when the CPU is at its top speed due to high load. This improves performance by reducing the overhead of load evaluation and helping the CPU stay at its top speed when truly busy, rather than shifting back and forth in speed. This tunable has no effect on behavior at lower speeds/lower CPU loads. up_threshold: defines what the average CPU usage between the samplings of ‘sampling_rate’ needs to be for the kernel to make a decision on whether it should increase the frequency. For example when it is set to its default value of ’95’ it means that between the checking intervals the CPU needs to be on average more than 95% in use to then decide that the CPU frequency needs to be increased. io_is_busy: if 1 waiting for I/O will increase the calculated cpu usage. The governor will calculate iowait as busy and not idle time. Thus cpu will reach higher frequencies faster with I/O load. 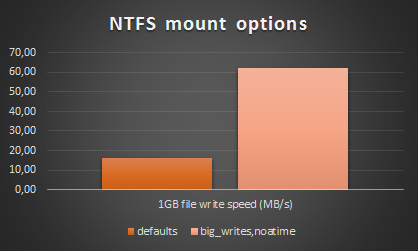 Besides the ondemand governor we will add the big_writes mount option to all NTFS mounts. In addition we will add noatime. big_writes: this option prevents fuse from splitting write buffers into 4K chunks, enabling big write buffers to be transferred from the application in a single step (up to some system limit, generally 128K bytes). noatime this option disables inode access time updates which can speed up file operations and prevent sleeping (notebook) disks spinning up too often thus saving energy and disk lifetime. # Optimize NTFS Performance OMV_FSTAB_MNTOPS_NTFS="defaults,nofail,noexec,noatime,big_writes"
Then you have to unmount, apply, mount, apply all your NTFS volumes in the web interface. This looks fairly fast but keep in mind NTFS is very cpu intensive on such a system. Therefore real network throughput via samba (which is cpu heavy as well) is way less compared to a native linux filesystem. 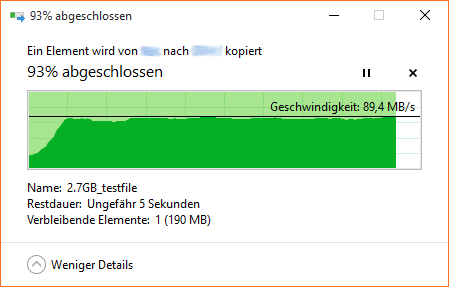 I tested this disk with samba and measured only ~30MB/s read and write speeds. This is considerably less than a native linux filesystem (see Samba benchmarks). 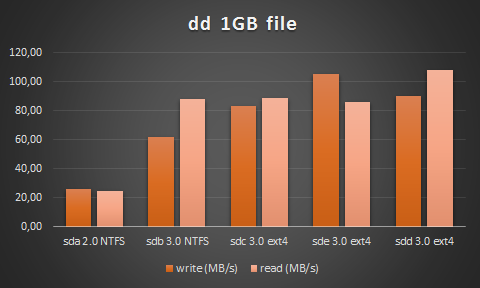 If you want to get full performance you have to use a native linux filesystem like ext4 or xfs. You really should! I really like the monitoring setup of OMV with rrdtool. Nevertheless I miss 2 graphs which I am interested in. It would be nice to have CPU frequency and CPU temperature graphs, therefore I extended the existing monitoring plugin. echo "PUTVAL \"$HOSTNAME/temperature/temperature-cpu\" interval=$INTERVAL N:$VALUE"
Finally reboot to see if everything is working as expected. All benchmarks were done with performance governor to get consistent results. I have several USB disks connected to my Odroid. 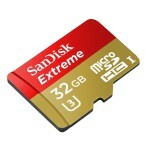 Expect one disk all are 2.5″ USB 3.0 disks. All USB 3.0 disks are connected to two active USB 3.0 hubs. The USB 2.0 disk is connected to the USB 2.0 port. In the following you can find hdparm read and dd read/write benchmarks for all connected disks. As you can see the performance is quite good and should be near the maximum the disks can handle. All network settings are default OMV/debian settings. I am satisfied with these results as it is close to the theoretical maximum of 1Gbit/s. 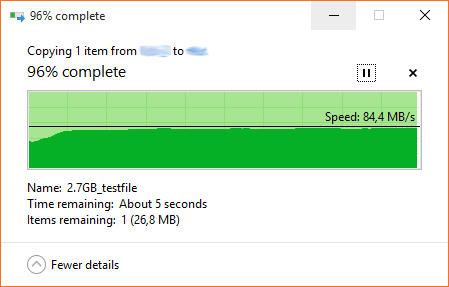 Disk and network speed looks fine. Because there are windows machines in my network I have to use samba to share files. As you can see samba speed is quite good and very stable. I will try to update this post regularly with new optimizations etc. I’m using an odroid xu 4q with an 7 years old WD My Book Essential 3TB USB 3.0 wich has a green line harddisk inside. On my Gigabit LAN I’m getting up to 113Mb/s write speed with large files!!! plugin_load: plugin “cpu” successfully loaded. plugin_load: plugin “cpufreq” successfully loaded. plugin_load: plugin “df” successfully loaded. plugin_load: plugin “disk” successfully loaded. plugin_load: plugin “exec” successfully loaded. plugin_load: plugin “interface” successfully loaded. plugin_load: plugin “load” successfully loaded. plugin_load: plugin “memory” successfully loaded. plugin_load: plugin “rrdcached” successfully loaded. Error: Reading the config file failed! I looked in /usr/lib/collectd and there is a .so file for cpufreq and cpu, but nothing for cputemp. In the enable big writes section you said “Then you have to unmount, apply, mount, apply all your NTFS volumes in the web interface.” – Is there any way to do this without losing all your shared folders? Can I back up the shared folders, delete them, remount and then restore the shared folders? Doing an ls of /sys/devices/system/cpu/cpu0/cpufreq/ shows that the directory “ondemand” doesn’t exist. I have hardkernel Ordoid HC2 (which is strip down XU4) and I wanted to add cpu grapht but id does not work on HC2 (obvoiusly fun is not there, but cpu clock and temp grpfs are empty as well). Could you tell me how to modify your scrips to get it works, please. BTW you size increase for graphs worked very well. any plans to update monitoring plugins for omv4? how i can remove cpu fan speed? 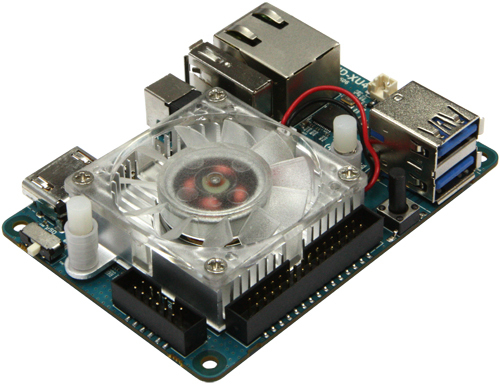 Installed the stuff on Odroid-HC1, which has no fan. I too would appreciate instructions how to remove the fan-speed collectd and graph. Before you install the package you should remove all relevant files – search for CpuFanSpeed and execfan. AFAIR, there should be a .py plugin, a collectd config and a UX config. NB: If you have already installed the files you have to remove the config manually. For some reason executing the collectd refresh command that comes with the OMV does not remove old configs.